Most educators pass information to the students that's the best they can do, but they don't know. They've never gotten their teeth kicked in on the Ellington bus. The title Sound Painter was chosen because Hamilton has a famously broad palette. An unrivalled brush player, he's always experimenting with different soundsoften playing the head of a tune, he bends pitches to make his drums melodic as well as percussive. Then there's his fabled hand-drumming, where everything, including his ring, can become part of the music. 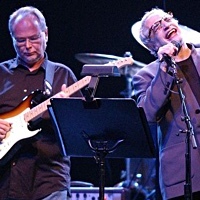 His rendition of "Caravan" features both techniques: while it's exciting to hear on CD, watching it is nothing less than transcendent. On a 2005 Caribbean jazz cruise on the M/S Zuiderdam, I asked some of Hamilton's colleagues to describe him in one word. 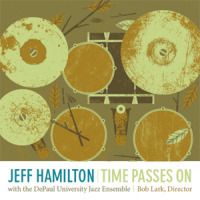 Fellow drummer Ed Metz, Jr. instantly said "astounding." Other speedy answers were "creative" (Ken Peplowski), "swinging" (Lynn Seaton), and "suave" (Bill Mays). Uberbassist John Clayton, Hamilton's co-leader in the Clayton-Hamilton Jazz Orchestra and his closest friend, needed a moment to distill their decades together into one word: Clayton finally came up with "remarkable." 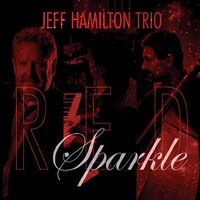 And speaking of remarkable: when I separately asked the members of the Jeff Hamilton Trio the same question, they each came up with "exuberant" without any discussion between them. 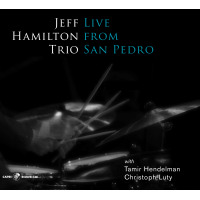 According to pianist Tamir Hendleman, the adjective reflects Hamilton's obvious enjoyment of life, people, and humor. "Exuberant" is also a good descriptor of his style on the bandstand, where his mischievous, dimpling, contagious grin frequently appears, as if he's just been tickled by some private delight. Defying the usual laws of career physics, Hamilton's career started at the top, with the Dorsey band, and has only gone higher. [Note: Hamilton's first album, Live! Montreux Alexander(MPS, 1977)with John Clayton and Monty Alexanderstill stands as one of the greatest live trio albums of all time.] Part of the Thundering Herd, the Ray Brown Trio and the L.A. 4, among other configurations, he's been on over 200 recordings, including several Grammy winners. The most recent was the Good Night, and Good Luck soundtrack; on screen, there's a brief flash of trio bassist Christophe Luty, but Hamilton's face ended up on the cutting-room floor. He has his own busy trio and other entrepreneurial interests, drives the Clayton Brothers Quintet, and tours and records with the Clayton-Hamilton Jazz Orchestra (CHJO). 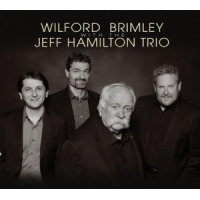 Recent doings include a fine new trio CD, From Studio 4, Cologne, Germany (Azica Records, 2006) and upcoming CHJO recordings with Diana Krall and Gladys Knight. Our interview took place on November 3, 2005 after a long night of partying and jamming, so Hamilton was a bit less exuberant than usual. But, ever the professional, he kept our appointment instead of taking the nap he so clearly needed. All About Jazz: I've heard you say 'when I played with Dorsey,' and 'when I played with Woody Herman'and then there's Hampton and Basie. You must be a hundred and five, given all the people you've played with. 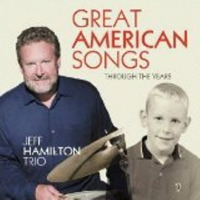 Jeff Hamilton: I just knew what I wanted to do very early. I saw Gene Krupa when I was eight. I grew up in a musical family: my mother was a Baptist church organist, and I have two older sisters who were also musicians. I was supposed to be the pianistthe Eddie Duchin/Peter Nero of the familybut Gene Krupa got me, on TV, on the Merv Griffin Show. AAJ: What got you about him? JH: The fact that he was having so much fun with what he was doing, and that he was so dapper. I'd seen marching bands before, but I'd never seen a drummer do all thatat that time, nobody was doing it like Geneso it grabbed me, and I said that's what I want to do. If you do start that early, you get a leg up on everybody else. I was in the Dorsey band when I was 19. It was a ghost band, but it was OK, now we're off and running. And then Lionel Hampton hired me off of that band... He was the first live leader I played with. 'Hammy from Naptown' is what he called me, since I came from Indianapolis. I wanted to play with Oscar Peterson and Ray Brown and Woody Herman and Count Basie. Of course they're all quite a bit older than I am, but I've been an old soul since I was a kid. I related to my grandmother probably more than anybody else in my family growing up, [and] had a better time with my older relatives, aunts and uncles, than the kids I was going to school with. I thought those kids were morons because they were listening to dumb music and dressing stupidly. I was kind of like this 40-year-old high school student (grins).